Is NATO doing enough to pressure Russia over Ukraine? The crisis in Ukraine was the impetus for NATO to reinvent itself, but is the alliance sufficiently invested in resolving the conflict itself? No one will declare the Minsk Agreement dead, but it's hard to find a pulse. Russia's annexation of Crimea and power grab in eastern Ukraine more than three years ago was a shock to NATO's system. The alliance realized if Moscow moved further west in its quest for territory, it would not be equipped to fend off the assault. NATO drastically reconfigured itself politically and militarily in response. "2014" is a constant reference point in every discussion about the organization's reinvigoration. But the conflict itself has remained stubbornly impervious to Western efforts to end the separatist standoff. Russia hasn't had to give up a centimeter of Crimea nor its dominance in the Donbass, and the rest of the world seems increasingly resigned to living with that fact rather than stirring up yet more animosity over a non-ally. No one is calling it a "frozen conflict" yet, but there's no progress to report, only continuing deterioration. In the course of his last three years as the principal deputy chief monitor of the OSCE's mission — designed to verify what should have been a demobilization process — Swiss diplomat Alexander Hug (pictured at top) has been a model of neutrality. But with the ongoing strain of continuing civilian deaths and hardship, the parties' disregard for steps required under the 2015 Minsk Agreement, and the unarmed monitors in his Special Monitoring Mission (SMM) frequently having heavy weapons pointed at their heads, the diplomat is sounding increasingly exasperated. "The Mission has registered over 330,000 ceasefire violations this year alone with a noticeable increase in violence over the last four weeks," Hug told DW. "Impediments to SMM monitoring — including sometimes violence or threats of violence against our monitors — continue." Hug said the four terms of the Minsk deal — a ceasefire, withdrawal of weapons, disengagement and demining — have not been fully implemented "because the sides — in addition to undermining the SMM — also lack the political will to do so." He acknowledged that, with the turmoil in its fourth year, "world attention is drawn towards other areas of concern. Indeed, reports of the victims and destruction caused by this conflict are often confined to the back pages." But Hug said that doesn't mean the international community has given up, underscoring continued diplomatic efforts in the so-called Normandy Format, involving Germany, France, Russia and Ukraine, along with strong support for his own monitoring mission. Ivanna Klympush-Tsintsadze, Ukraine's Deputy Prime Minister for European and Euro-Atlantic Integration, said it's a mixed picture. Currently on a visit to Brussels for talks with European Union and NATO officials, Klympush-Tsintsadze told DW she'd like to see NATO "take a political decision" to enhance cooperation and opportunities regarding Ukraine's defense and security reforms. "That would be very helpful if NATO stepped up its actions," she said. She also points out that more financial support is needed in the six trust funds NATO has established for Ukraine, which finance programs including rehabilitation for wounded soldiers and demining. However, Klympush-Tsintsadze said the level of NATO support in many other spheres is "unprecedented," with programs in education, professional training of civil servants and science, to name just a few. And despite US President Donald Trump backing off early signals that he'd be ready to provide lethal aid to the Ukrainian government, the deputy premier believes that is in the works. "We are much closer to the decision on providing Ukraine with defensive weapons than we have ever been," she said, mentioning enormous bipartisan support in the US Congress. "I hope it's just a matter of time before it will be a reality." Ahead of her first ministerial in her new post, US Ambassador to NATO Kay Bailey Hutchison said the Trump administration is still considering the lethal aid option. "We don't want a civil war in the Ukraine," Hutchison said, alluding to one of the arguments against arming Kyiv. But she had harsh words for the Kremlin. "Russia is meddling in the Ukraine or worse," she said. "We're doing everything we can, short of fomenting a civil war, to try to get Russia to abide by the Minsk agreement and leave the sovereignty of the eastern Ukraine at least, if not the Crimea as well." For some Ukraine watchers, tough language isn't enough. "No matter what atrocities Russia commits in Ukraine, there is effectively no push from EU countries for furthering pressure against Russian aggression," Jakub Janda, head of the Kremlin Watch Program and Deputy Director at the Prague-based European Values think tank, told DW. 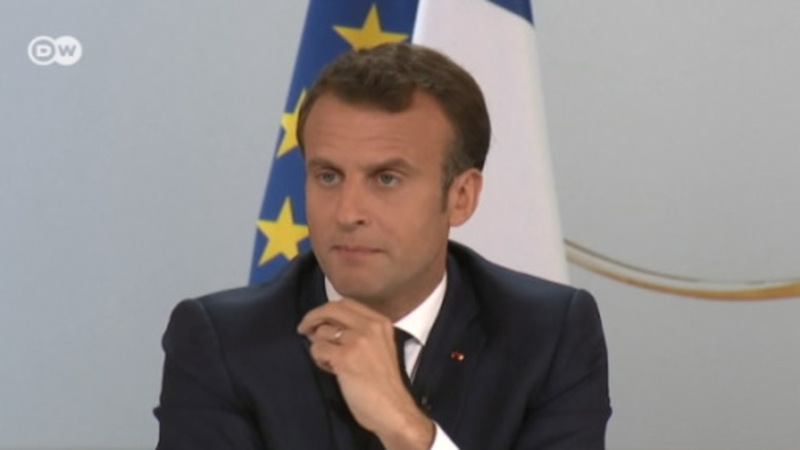 "France under President [Emmanuel] Macron has so far shown no real pushback against Russian aggression, Germany is now in a limbo over negotiating the coalition. With the UK stuck with Brexit and Poland in diplomatic struggles with its allies, there is no major power in Europe who would push for effectively punishing Russia and stopping it from ongoing attacks." The Centre for European Reform's Ian Bond is of a similar view and added a further warning. "People have lost focus on this and that's the most dangerous time," Bond told DW, comparing the situation with that in Georgia. "The world is not focusing on Georgia at all and that enables the Russians to keep moving forward the border fence a few meters at a time and a little more of Georgian territory is cut off every time and nobody does anything about it." Could Germany's FDP sink Angela Merkel's coalition talks? Ukraine fears the holiday season may bring new hostilities with Russia. A key American diplomat warns that international support for Kyiv is urgent — and so far absent. Teri Schultz reports from Brussels.